Directed by Cristina Gallego and Ciro Guerra. Colombia. 2018. English, Spanish, and Wayuu with English subtitles. 125 min. 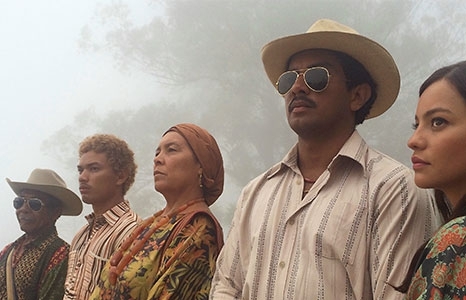 The highly anticipated new film from the creators of the Oscar-nominated Embrace of the Serpent, Ciro Guerra and Cristina Gallego’s astounding Birds of Passage is an epic, visually exquisite story about the origin of the Colombian drug trade, told from the perspective of a proud indigenous family. Guajira, Northern Colombia, 1970s. Wayuu tribe-member Zaida (Natalia Reyes) has come of age, leaving formidable matriarch Ursula (Carmiña Martínez) with the important task of finding a suitable match. Her instincts warn her against young Rapayet (José Acosta), an ambitious man with strong links outside of the clan, but the word of his respected uncle Peregrino (José Vicente Cotes) carries weight, so she sets an outrageous dowry. The seed sown, Rapayet stumbles onto a plan with his flamboyant friend Moises and cousin Aníbal to sell marijuana to a visiting American. It’s the beginnings of a profitable new enterprise. As the family rises to prominence, Ursula becomes increasingly complicit in her son-in-law’s business dealings, insisting traditional honor codes are respected and observed. But the trappings of wealth and power soon incite a war that threatens to tear them and their ancient traditions apart. A unique sensory adventure, Birds of Passage—with its fascinating depiction of dueling tribal codes, rituals and beliefs, and the destabilizing impact of outside influences—couldn’t be further removed from the time-honored, rags-to-riches crime sagas of Western cinema.